Elder care provides a unique opportunity for adult children, family members, and friends, but it also involves a number of challenges. While most individuals consider family caregiving a personal responsibility, many find the obligations difficult to fulfill. Challenges may range from physical to mental to emotional - often on a daily basis. The stress of caregiving affects each of us in different ways, and can be caused by anything that requires us to adjust to a change that overwhelms our emotional capacity. A recent study reported that caregivers visit healthcare providers twice as often as non-caregivers. Caregivers also take 70 percent more prescription medications, and visit the emergency room 25 percent more than those who care for only themselves. Clearly there are significant reasons for looking into alternative care options. Fortunately, today’s technological advances, such as ClearCare’s homecare system and homecare software, make it easier than ever for families to stay involved with their loved one’s care – even if they can’t personally be there. A conservative estimate reports that nearly 20 percent of family caregivers suffer from depression, while some experts claim the rate is much higher. According to California’s Caregiver Resource Centers, 60 percent show clinical signs of depression. Ignoring the signs of symptoms of depression will only make matters worse. As soon as the responsibilities of care begin to become overwhelming, it is time to take positive action. Working with a reputable home care agency, specifically one that offers ClearCare’s homecare system and homecare software, will relieve stress and prevent emotional burnout. Caregivers need to be aware of the emotional changes that seniors endure as they grow older and more dependent on others. Feelings of inadequacy and loss of control may leave seniors feeling anxious and irritable – which may end up transferring to their caregivers. Constantly dealing with complaints, worries, fears and tears can take a huge toll on a person’s mental well-being. Seeking additional support does not mean that you have failed your loved one in any way. On the contrary, it means that you are making their safety and care a top priority. 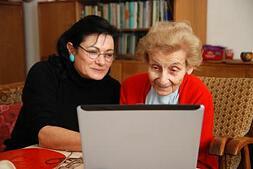 Reaching out for support through a trustworthy home care agency is the ideal solution. Be sure to look for an agency that provides quality caregivers, and can offer real-time visibility to patient point-of-care through a reliable homecare system or homecare software. This will give you peace of mind, knowing that your loved one is being cared for properly. With ClearCare’s homecare system and homecare software, you can “check in” on your relative’s care at anytime, from any mobile device or computer. Caregivers can easily communicate any problems or concerns to you so that important issues can be addressed right away. Taking care of your emotional health is not only vital to your personal happiness, it will also allow you to provide better care and support to your loved ones. If you have questions about how ClearCare’s homecare system and homecare software can help your caregiving situation, call one of our friendly representatives today.